Was thinking about how it takes to high heals and stomping. Would plexiglass hold up? plexiglass has somewhere over an order of magnitude in concussive strength over plate glass. crazing (those aesthetic wear fractures you see in plastics) is a huge problem with plexi though so some math would have to be done for minimum thickness…. or just have fun stomping on some samples. I just finished watching Austin Powers and now I see this, I’m in a frickin’ time warp! Unfortunately the project is finished and you cannot purchase the boards any more. 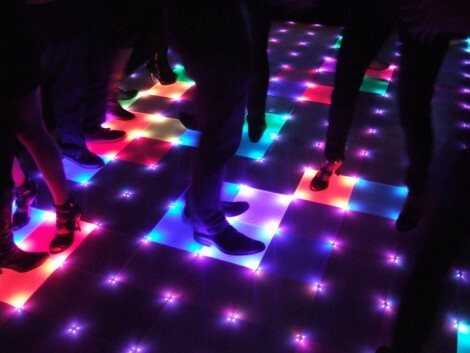 It would be thousand times more interesting if they did some kind of dance dance revolution with these floors. Or something more simple: VU meter, that takes their position as origin, so if you want VU meters near your feet, you gotta move around! Those guys have some other nice projects from a 2m propeller display over a 5*2.5 meter ping-pong display to a waterfall display as well. Guys from The Big Bang Theory? Whoever that is, he is not dancing.